Explanation: On August 3rd, the Rosetta spacecraft's narrow angle camera captured this stunning image of the nucleus of Comet 67P/Churyumov-Gerasimenko. After 10 years and 6.5 billion kilometres of travel along gravity assist trajectories looping through interplanetary space, Rosetta had approached to within 285 kilometres of its target. The curious double-lobed shape of the nucleus is revealed in amazing detail at an image resolution of 5.3 metres per pixel. About 4 kilometres across, the comet nucleus is presently just over 400 million kilometres from Earth, between the orbits of Jupiter and Mars. 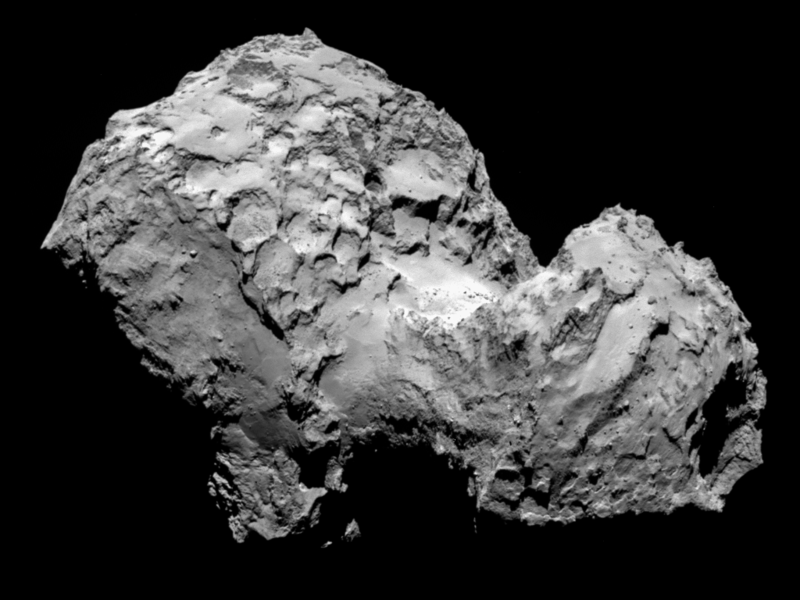 Now the first spacecraft to achieve a delicate orbit around a comet, Rosetta will swing to within 50 kilometres and closer in the coming weeks, identifiying candidate sites for landing its probe Philae later this year.